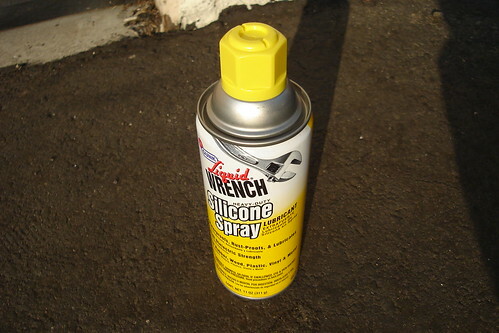 Go to your local auto parts store and pick up a can of silicone spray. This one only cost about $2.99. Then spray it all over your frame to make it all shiny and purdy. The silicone leaves your bike clean and it helps repel dirt and water. It also makes it easier to clean your bike next time. Alot of the bike polish products out there like Finish Line, and Pedro’s Bike Lust have silicone in it. But those products can cost up to $10! But with this alternative, you just saved yourself at least $7. Silicon based sprays are okay for the frame. But you have to be really careful where it is applied. If even a relatively small amount gets into anything that moves, it will collect dirt very rapidly and grind away at the moving parts. It is almost like taking a sand blaster to your bike. Great tip RC. It’s also a great idea not to get it on your brake pads and your rims, especially v-brakes! One of the best theft deterrents in a major city is a dirty, logoless bike, so if you’re going for the opposite effect, wrap your frame in electrical tape. Technically, the frame is clean and protected, but it looks like a mess. Also, white cork tape on the bars gets real dirty, real fast. Highly recommended if you’re going for that broken-in look. Note on the good idea from Nick, is shrink wrap. Especially the heat activated stuff. The advantage of this stuff is that if you want to remove it at some point it doesn’t leave very much residue behind (which tape can do). It provides an excellent cover against all kinds of weather and is very water tight. I like using it on my handlebars and seat post as I can use it to prevent water from getting into bolts and bolt holes, which can be difficult to seal with any other method. Silicone spray does not attract dust and dirt and is a good lubricant/sealer. It is also a preservative for rubber seals, gaskets, etc. Conversley, oil and petroleum lubricants attract dust and dirt! Therefore, silicone may be utilized anywhere on a bike to lubricate and prevent corrosion. No need to worry if you should accidently get some on your tires! ps: It is, however, not ment for lubrication of bearings and such! A propper grade of grease should be utilized for such purposes. Look Out Weekend Here I Come!